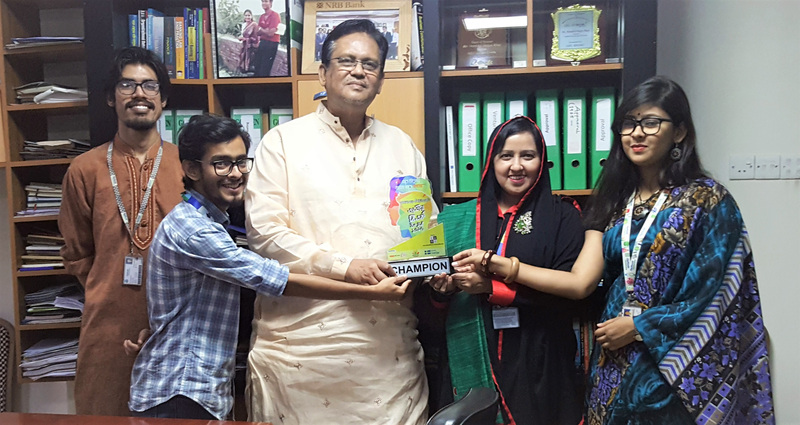 ‘MJF CUUSD National Debate-2019’championship winning team team members of DIUDC pose for a photograph with Hamidul Haque Khan, Treasureof Daffodil International University where Professor Dr. Farhana Hela Mehtab, Moderator DIUDC was also present. Daffodil International University Debating Club (DIUDC) has become Champion in ‘MJF CUUSD National Debate-2019’organized by Chottagram University School of Debate in association Manusher Jonno Foundation. The final round was held between Daffodil International University Debating Club and Premier University Debating Society on 23 March, 2019 where DIUDC became champion. The debater of DIUDC was Al Mukit Bari, Omar Faruq Shimanto and Nazia Afroz. Omar Faruque Simanta of DIUDC became Debater of the final. The final debate and prize giving was held in Theater Institute, Chattagram while Dr. Iftekhar Uddin Chowdhury, Vice Chancellor, Chittagong University was present as the chief guest. It may mentioned that total 32 teams from 28 university around the country participated in this two days (22-23 March, 2019) competition.